Summary A series of year-long comparisons between the total ozone measurements done with a Brewer at the RMI at Uccle (Belgium) and the Microtops II sunphotometer at Diekirch (Luxembourg) shows a good linear relationship between both instruments. It is suggested to apply a multiplier of 0.93 to 0.95 to the Microtops readings which are most of the time in excess to the Brewer. The Microtops II measurements are manual measurements, done by the operator when weather conditions allow, e.g. when sufficient sun-shine is available. The instrument is always directed to the sun; the readings correspond to the mean of three measurements, each one being itself the mean of 40 fast samplings done during approx. 10 seconds. For computing the total ozone thickness, several other parameters are simultaneously measured: barometric pressure, precipitable water column, aerosol optical thickness. Location, altitude and time are programmed into the device according to the measurement place (see the data download arear for the complete files in the format mtopxxyy of the original Microtops measurements). Ground-level ozone data are also available at meteo_lcd; their influence on the total ozone column will be discussed in a separate report. At Uccle, the majority of the measurements correspond to a zenithal orientation (ZS = zenith sky observation), but a more or less large subset are done with the instrument pointing to the sun (direct sun orientation DS). A best comparison should be restricted to these data; nevertheless for the sake of completeness a comparison using all Uccle data will also be done. This will be clearly stated in the paper. Uccle and Diekirch are close enough to permit a straight comparison of the measurements. The correlations are made using the Brewer reading which is closest in time to the Microtops measurement. The time interval between the two readings is usually less than 30 minutes. In the great majority of the cases, the Microtops measurement of the day was made around 12:00 UTC. The comparison will be done in a manner to yield a correction multiplier for the Microtops readings, under the assumption that the Brewer data do represent the "true" situation. It comes as a surprise that the mean over the 2 years of the Microtops data is closer to the "Brewer zenithal data" than to the "Brewer direct sun". The relatively large difference between the direct sun readings in 1998 could at a first glance be due to a drift in the Microtops, possibly caused by low battery power, even if no poor battery warning was given by the instrument. At the end of 1998, battery voltage was down to 5.2 V with the instrument switched on, in idle mode (power supply is by 4 alcaline AA cells, with a nominal 6.0 to 6.3 voltage when new). The graph on the left gives the results for the period from 01-Jan-97 to 31-Dec-98. Visual inspection shows a quite good accordance between both series, with a possible increasing deviation at the end of 1998. This graph is practically indistinguishible from the preceeding. Small differences will show up in the next correlation graphs. To get a more precise idea, let us make different linear fits Brewer = slope * Microtops forced through the origin; we will separate the data according to measurement orientation and time-span. An immediate (and expected!) conclusion is that the best fits ( highest goodness of fit) are those made with the Brewer direct sun data, even if the slope (=correction factor) may be closer to 1. Nevertheless, the small differences with the whole Brewer data set show that a valid comparison must not absolutely be restricted to the Brewer direct sun measurements. To conclude, we will analyse the differences between the Brewer direct sun data and the Microtops readings for a possible deviation trend. The linear fit over 1997 on the differences (Brewer_ds - Microtops) gives a zero slope: assuming the Brewer data the "true" ones, we have a small and constant zero offset of about -8.7 versus the Microtops; in 32 cases out of 35 the Microtops readings are higher than the Brewer direct sun data. The situation changes markedly during 1998: a increasing offset shows that the two instruments drift apart during that year, the zero offset increasing from about -12.6 in January to -20.7 at the end of the year. 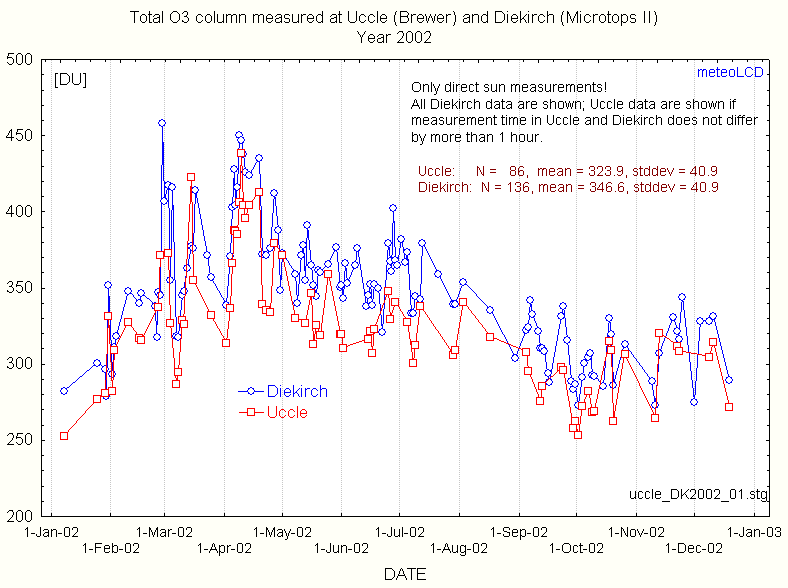 In 37 cases out of 39 the Microtops readings are higher than the Brewer direct sun data. As stated before, and assuming a constant correct working of the Brewer, this drift could be due to falling battery power. All measurements were done exactly from the same spot, in the same manner; if the integrated electronics of the Microtops remained stable, battery power seems to be the only plausible factor. As a precaution, one should change the batteries after 400 measurements or after one year of usage, whatever comes first. The Uccle data have been downloaded from the WOUDC data archive; Uccle is WOUDC station 53. It should be noted that this database does not contain a time information. Practically all Microtops readings have been made between 11:30 and 12:30 UTC. We consider only the direct sun measurements for this intercomparison. Visual inspection shows a quite good accordance between both series, with a slight permanent excess of the Microtops readings to the Brewer. A linear fit forced through the origin gives a slope 1.049, what would be the divider to apply to the Microtops readings to get the (assumed correct) Brewer readings. The multiplier would be 0.95. The graph shows that the Microtops readings are almost always higher than the Brewer. The mean relative (to Uccle) difference between Microtops at Diekirch and Brewer at Uccle is 4.9% (Diekirch being higher). The Uccle data have been downloaded from the WOUDC data archive; this year Uccle has only few direct sun (DS) data. There are also much fewer data available, mostly due to instrument problems in July and bad weather conditions (communication by Dr De Backer). The database now contains all needed time information. Uccle and MeteoLCD data are usually made at near same time, the time difference being rarely greater than 1 hour. Most Microtops readings have been made between 11:00 and 13:00 UTC. 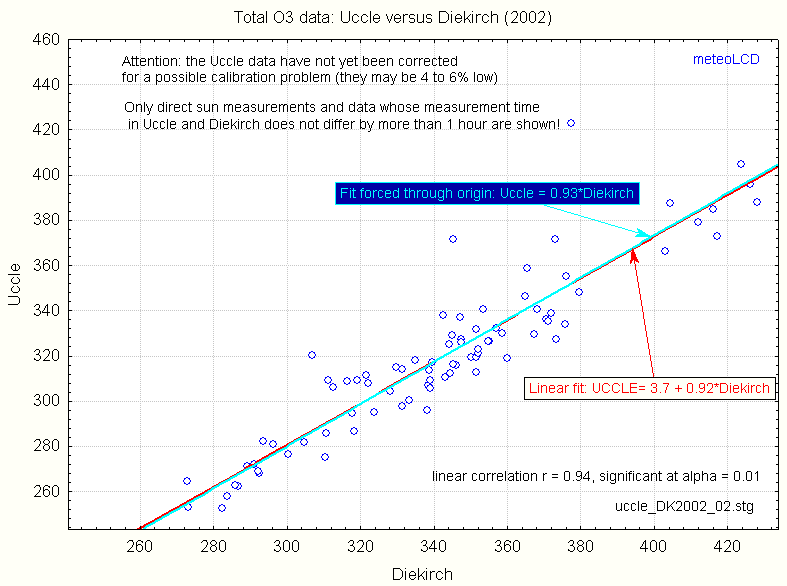 The mean of the Uccle DS data is remarkably lower than the overall mean, the meteoLCD mean being close to the latter. We will fit the meteoLCD data to the complete Brewer data set to get a calibration factor. Click here for an Excel file with the 2001 data used. Visual inspection shows a satisfying accordance between both series, with a permanent excess of the Microtops readings to the Brewer. For clarity reasons, the Brewer plot contains interpolated points between the measurement data. The linear correlation is r =0.97 ( N=65 ), the offset practical zero and the slope 1.06, the same as previous year. A linear fit forced through the origin gives a slope 1.06, what would be the divider to apply to the Microtops readings to get the (assumed correct) Brewer readings. The multiplier would be 0.94. So no big change here between the 2000 and 2001 data. 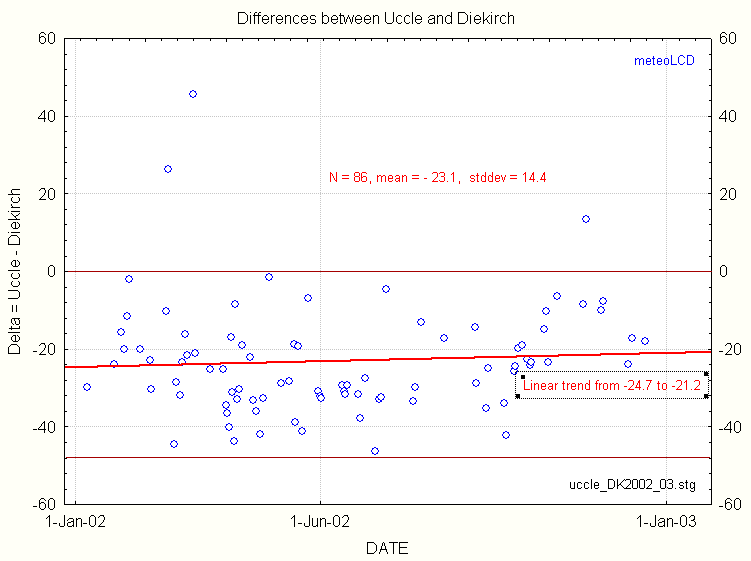 There are N = 65 same day measurements: the mean of the difference between Diekirch and Uccle is 20.3 +/- 11.9 (i.e. 6%). The Uccle data have NOT been downloaded from the WOUDC data archive; this archive gives only mean values for each day, with measurements extending often over a long time span ( e.g. from 10:00 to 14:00) and displaying large standard deviations (meteoLCD usually makes 3 to 4 measurements in a row, and the standard deviation usually is very small). To make a more realistic comparison, we asked Dr. De Backer for the full Brewer ZS and DS measurement file, and will make the comparison using only the DS measurements done at nearly the same time as in Diekirch (only data where the time difference is less than 1 hour were kept). An important caveat: Dr. De Backer told us that the RMI Brewer data may be 4% to 6% too low, and that a recalibration of the Brewer will be made in 2003, with a recalculation of the affected 2002 data. We will redo the comparison with these data if they are available. Visual inspection shows a satisfying accordance between both series (with several large outliers), with a permanent excess of the Microtops readings to the Brewer. The linear correlation r =0.94 is significant; the offset of the linear regression line is small (3.7) and the slope 0.92 (to be compared to 0.94 for the year 2001). The calibration function to apply to the Microtops readings would be 0.92*Microtops + 3.7, or if one ignores the small offset: 0.93*Microtops. The conclusions that can be drawn in this (v.1.4) report do not differ much from those given in the previous versions: There is a good correlation between the Microtops data at Diekirch and the Brewer data at Uccle. A multiplier of 0.93 - 0.95 should be applied to the Microtops readings. In this comparison the "corrected O3" data from the Microtops have been used; there is some debate if one should not use only the channel 305/312 data (personal communication Gordon Labow). Again it should be noted that the conclusions for 2002 are preliminary: if the suspicion of RMI holds, the differences could be much smaller, and the multiplier to apply closer to 1. Special thanks to Dr. De Backer of the Royal Meteorological Institute of Belgium (RMI) for his continuing kindness and help and to Ed Hare from the World Ozone and UV Radiation Data Centre (WOUDC).